At Oxner + Permar, we’re not only passionate about our clients, we’re also passionate about giving back to our communities. In May, we had the awesome experience of getting to work with Habitat for Humanity. Habitat for Humanity is an incredible organization that builds homes for families in need. 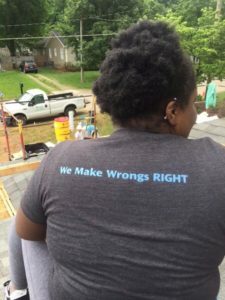 They work with a variety of volunteers and companies to help get these homes built. So, on May 13th, we spent the weekend helping with a build in Greensboro. Eleven members from our office met up with a team through the Greensboro Bar Association and came together to build this home. It was such an incredible experience! 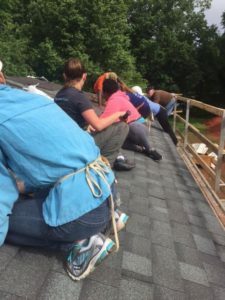 For one, the family was there working with us to shingle the roof. We had a great time getting to know the family and talking with them about their experiences. Everyone was so kind. Some of the other volunteers were also hoping to seek help from Habitat for Humanity. 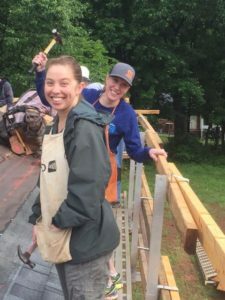 They’d put their applications for assistance in, but in order to be considered, they needed to log a certain number of volunteer hours with Habitat. And in the end, we got the roof finished! We had such a wonderful time getting to know everybody, and spending a day giving back to the community. It’s truly a wonderful opportunity to not only lend a hand, but get to meet the people we were helping. 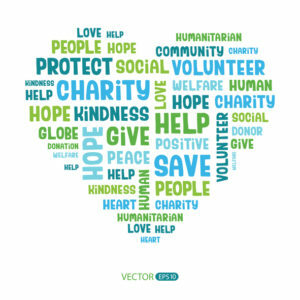 We’re looking forward to our next opportunity to volunteer with Habitat for Humanity! If you’re interested in volunteering for Habitat for Humanity or have any questions about their organization, be sure to visit their website! You may remember from one of our previous blog posts (August 26, 2016) that the Xarelto Bellwether trials were supposed to be underway by now. In fact, the first case was supposed to have been heard in February. However, the trial was postponed. What caused this major trial to be postponed may surprise you. Generally, courts don’t like to postpone trials if they can help it. But it does happen. 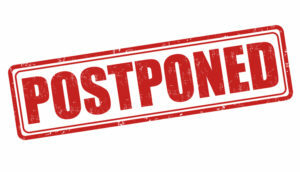 Trials can be postponed for things like family emergencies or scheduling conflicts. Sometimes they’re delayed because of a change of venue or because more time is needed to prepare. The reason for the delay of the Xarelto Bellwether trials? Basketball. That’s right, basketball. The NBA All Star game was scheduled for the middle of February – the same week as the Xarelto Bellwether trials. Because of this, both parties agreed to delay the start of the trials. Though the exact reason as to why they didn’t want the trials to start the same week as the game is unknown, we can speculate that maybe they didn’t want the distractions of two major events happening at the same time. The trials were rescheduled for March. The first trial was moved to March 13th, and the second will take place on April 24th. The results of the first four trials are going to have a huge impact on the outcomes of the cases that come after, so be sure to look for the results of these cases! If you or someone you know has been the victim of a defective drug or medical treatment, be sure to contact an experienced attorney at Oxner + Permar for a free consultation. We talked last month about a couple of charities that Oxner + Permar is proud to work with, and this month we thought we’d share another. A Simple Gesture is a wonderful program dedicated to making sure that food banks and pantries are fully stocked with everything they need to help serve the community. While this program has a national reach, we work directly with the Greensboro branch to ensure that we’re doing our part for our community. Participation is, as the name suggests, simple. But it makes a huge difference! Every month we give our employees little green bags. When they go to the grocery store, the just need to buy an additional nonperishable food item to fill the bag. Then, once a month, a volunteer comes to collect all of our full green bags. They distribute the bags to organizations such as Out of the Garden, The Greensboro Urban Ministry, Backpack Beginnings and Jewish Family Services. All of the organizations that A Simple Gesture donates to have waiting lists to fill. It makes us happy to know that we’re helping to alleviate some of that need. If you’re interested in helping out or donating to A Simple Gesture, get your company involved, or sign up as an individual! Volunteers will drive to your house to collect your green bag, which means you can give without having to take time out of your busy routine. If you have any questions about volunteering or donating to A Simple Gesture, be sure to visit their website for more details. It’s impossible to overlook it. New construction is going up everywhere in the Triangle. Whether it’s the newest set of apartments around the corner or the new shopping center that’s expanding down the street, it’s inescapable. Have you seen the Catholic Cathedral that’s going up off Centennial Parkway near the NC State campus? It’s massive! And it’s not even at the top of the list of the most expensive construction projects happening in the Triangle this year. I’ve heard a lot of different opinions about all the construction: Some people are really excited about all of the growth and the opportunities for new jobs. Others are annoyed with the noise and traffic that comes with construction and the congestion that comes with an increase in visitors or overall population. Whether you love it or hate it, the fact is that this growth doesn’t seem to be going anywhere — which is great for the construction industry who falls firmly on the “love it” side of things. But with all of this new construction comes construction-related dangers. When more people are working, the chance of injury is going to be higher. So it’s important to keep proper safety guidelines in mind. If you are injured at work, be sure to file a workers’ compensation claim. 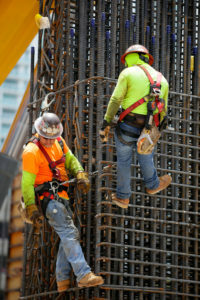 Most work-related injuries are covered by workman’s comp. Workers’ comp claims can be a long process, so it never hurts to have a workers’ comp attorney on your side who can help guide you through your claim. If you’re injured at work, don’t hesitate to contact an attorney. With more than $275 million in awards and settlements, Oxner + Permar has the experience to make sure you’re getting the benefits you deserve. At Oxner + Permar, we’re always excited to support a good cause. We like to do our part to give back to the community when we have a chance. I want to take this opportunity to tell you about one of the groups we work with, to try to get the word out, and bring some attention to a good cause. Rock and Wrap It Up is a very impressive organization that we partner with. They take unused food from schools and distribute it to the hungry. More than 50% of children in Guilford County are on free or reduced-cost lunch programs. This means all too often these children can’t afford to bring snacks for later on in their day. Rock and Wrap It Up saves unused packaged items from school breakfast so that these children can have them later in the day. Food that would otherwise be thrown away gets eaten, and children who would otherwise go hungry get to eat. It’s a win-win! As part of a 25-year-old nonprofit, Rock and Wrap It Up works hard to discover and vet agencies who are able to recover wholesale food and redirect it to those in need rather than sending it to landfills. They are diligent about following the USDA and Health Department of North Carolina’s guidelines to ensure that the food is safe and stored under the correct conditions in order for it to be passed along to those in need. 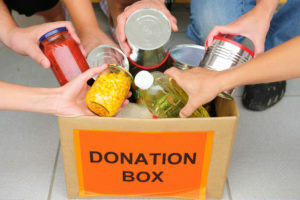 The organization also hosts the School Wrap program, which encourages students to get involved with saving food and sending it to those in need. This program has served more than 100,000 meals. We encourage you to find out more about Rock and Wrap It Up and contribute to this wonderful organization if you have the time or resources.